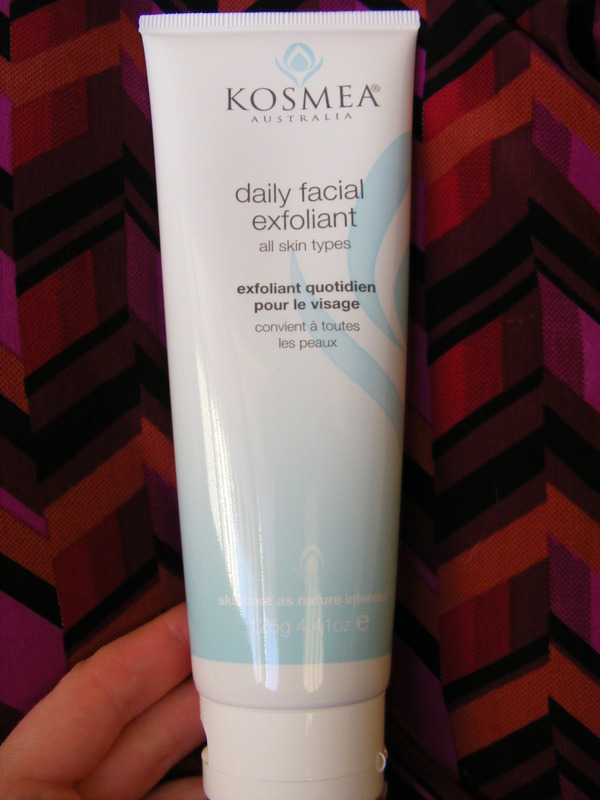 A couple of months ago I was sent this Daily Facial Exfoliant from Kosmea to try out. I have to admit that I was very sceptical about the concept of a daily facial exfoliator. My skin is quite sensitive and I’ve noticed in the past that over-exfoliation can leave me with a sore, red face. Also, as someone who has quite oily skin, I tend to steer clear of products that are too harsh, because they can make my skin freak-out and produce even more oil. But I was willing to give this a shot. This product claims to “slough off dead skin, get rid of excess makeup and remove impurities to reveal a smooth, radiant face”. The exfoliant comes in a simple tube packaging. I’m a fan of this type of packaging because it’s easy to store and very hygienic. The only gripe I have about the packaging is that the product is quite thick, and I can tell that it’s going to be a struggle to get the last dregs out of the tube. I don’t like wasting products, so that’s a downside for me. The first thing I noticed about this product is the scent. The scrub contains ground rose hips and chamomile flowers, and the scent is just divine. The smell is reminiscent of the products I’ve sampled at fancy day spas. It’s very floral and slightly herby. The exfoliant contains very small particles which gently remove the dead skin and dirt from your face. Unlike some scrubs, this one is extremely gentle and you don’t get that ‘rubbed raw’ feeling after using it. 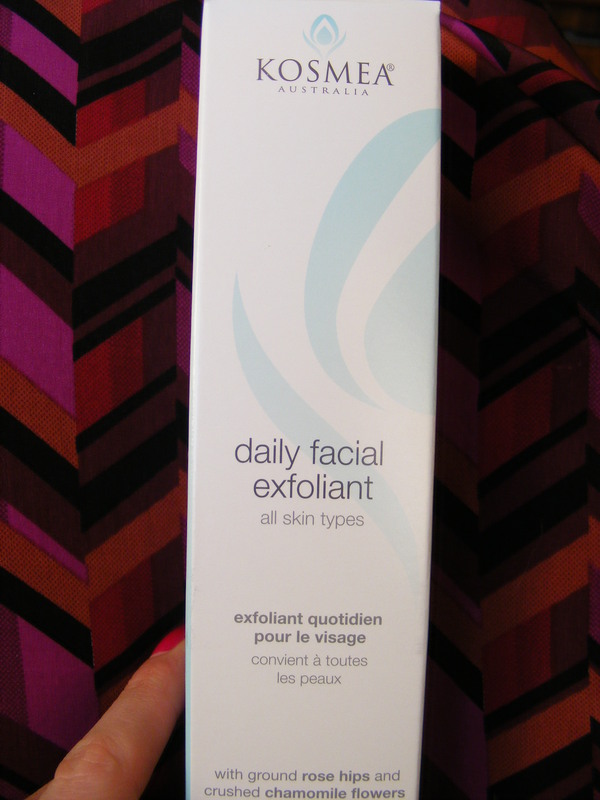 I’ve been using it in place of my usual cleanser in the morning, and it leaves my skin feeling very clean and smooth. I also noticed that my skin seems to absorb my moisturizer more quickly after I’ve used this. I’ve been using this for three weeks now, and I’ve noticed a difference in my skin. In winter, I typically experience a lot of dryness and flakiness, especially around my nose and forehead. While I’ve been using the Kosmea exfoliant, I haven’t noticed this at all. The regular exfoliation seems to make my skin more receptive to moisturising products, so I think my face cream is able to penetrate deeper into my skin. The result is more hydrated skin. I’ve noticed a difference in the texture of my skin as well. My face feels much softer and my makeup goes on a lot more smoothly. 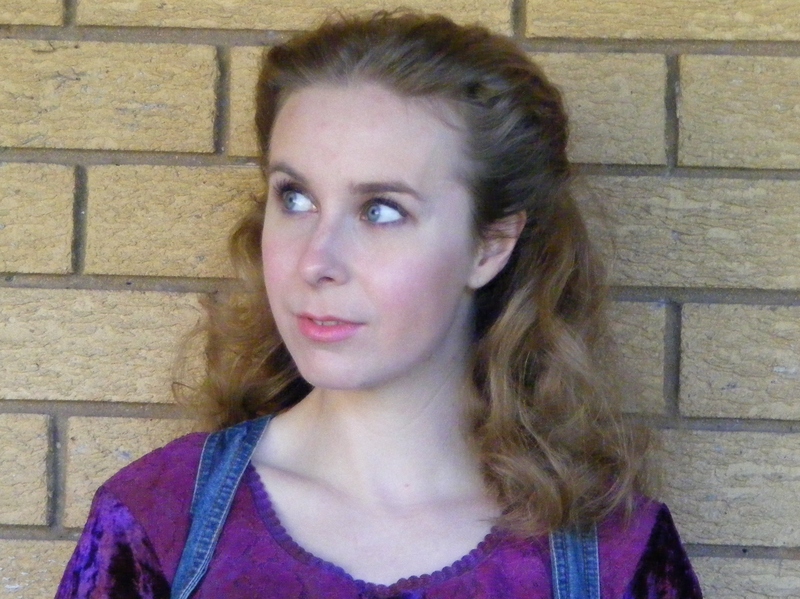 I had a friend comment recently that my face was ‘like porcelain’. My skin also looks brighter and fresher, and I’ve even gone makeup free on a couple of occasions. I haven’t experienced any irritation or redness from using this product, which is a huge deal because my skin tends to be quite sensitive. I am very happy with the way this product has performed and I would definitely recommend it if you’re looking for a gentle way to give your skin a boost. Kosmea Daily Facial Exfoliant is available from David Jones stores, selected pharmacies and health food stores. You can also purchase it online. Awesome! i might try it since my skin is having an attack of the stupids! That’s no good! I really recommend this scrub, particularly if you’ve got skin that’s misbehaving.